The Eisner Award-winning team behind the mega-hit Powers have reunited for The United States of Murder Inc., an ultra-violent alternate history crime story in which the five families of organized crime never lost their stranglehold on the United States. The nation is effectively split down the middle, and co-exist uneasily, a brittle truce between both sides. Expectations were naturally astronomically high for Bendis and Oeming’s new series, and the first volume of The United States of Murder Inc., Truth, delivers in spades. Indeed, moments after he steps out the door, a fireball erupts from The Ambassador, reducing the building to rubble. The uneasy truce that has existed between the United States Government and its corrupt opposite is suddenly under threat. Now both sides want Valentine to pay. His only ally is the trigger-happy hitwoman, Jagger Rose, who demonstrates an alarming propensity for killing Valentine’s friends. But following an earth-shattering revelation from his mother, the newly made man finds it increasingly difficult to separate friend from foe. The dialogue crackles, as we’ve come to expect from a Bendis scribed comic; but more than, the plot zips along at a fantastic pace. At times, especially in his late-Avengers work, I felt Bendis occasionally treaded water – six issue story arcs could be reduced to four or five – but there is no sign of that here. 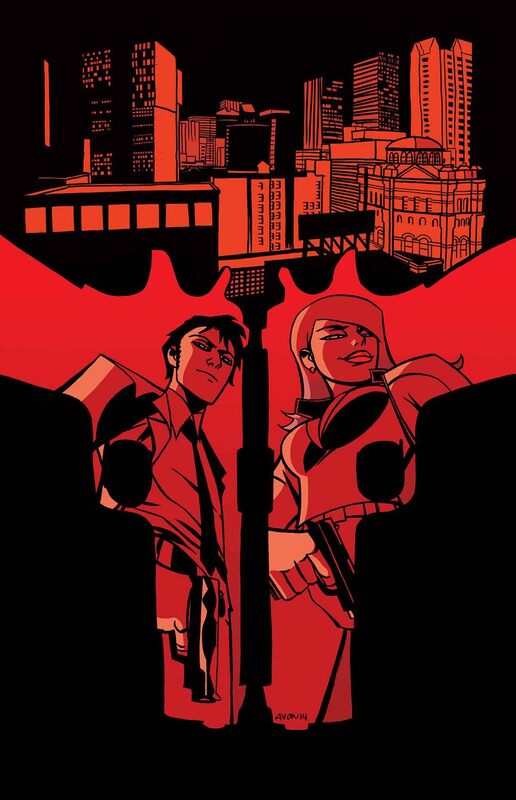 In The United States of Murder Inc. he packs each chapter with new characters, locations, and reveals; and Oeming renders them with dynamism only he is capable of. Truth is violent and bloody, but Oeming’s artwork – about as far away from realistic as you can get – ensures these moments are palatable rather than gratuitous. The first volume of The United States of Murder Inc. sets up an incredibly vibrant world, and ends with the kind of cliffhanger that’ll make the long wait for its next installment excruciating. The uncomplicated premise of Gabriel Hardman’s Kinski belies its underlying depth. On the surface it can be read, and enjoyed, as a fast-paced quirky crime story, about one man’s plot to abscond with a dog, Kinski, after he discovers it walking alone, seemingly abandoned, in the desert town of North End. The rigmarole involved in this plot, which soon switches to returning Kinski to its rightful owners, makes for a rollercoaster plot, with plenty of action and intrigue. But at the root of this compelling drama is a simple question: why is Joe so determined to ‘rescue’ this dog? What’s the driving force behind this quest that has so unhinged him? We don’t know much about Joe. Hardman, working dual duties as both writer and artist, resists the urge to relay Joe’s history through clunky narrative captions. Exposition in Kinsky is entirely non-existent, making for a truly immersive and cinematic experience. Joe lives the nomadic life of a travelling salesman. He carries an aura of the unloved: no real family to speak of (none mentioned, anyway) and while his two co-workers are affable, their interactions are professional, and don’t carry much warmth. Joe is aloof until he lays eyes on Kinski, when something in his mind snaps into place – love at first sight, with a canine twist – and he becomes infatuated with the well-being of the dog. He decides to take the dog home with him, consequences be damned – and the events that transpire from that moment spotlight Joe’s unbalanced personality. Importantly, he’s not malevolent – Joe’s not out looking for revenge, or seeking violence on those who seek to take Kinski away from him – there’s just something not quite right about him. There’s a screw loose somewhere, which fell all the way out once Kinski came into his life. Gabriel Hardman is a long-time movie storyboard artist and comics illustrator, so it’s hardly surprising that he nails the beats of his story, expertly breaking down the action, and portraying the emotions of his characters. Kinsky is a black-and-white comic, but the colour isn’t missing; the artwork was rendered with this colour scheme in mind, and it’s so successful, it’s hard to imagine it with a vibrant palette. And while the dialogue is sparse, it’s apt; like a true storyteller, Hardman knows when silence will suffice, and when a couple words say as much as a dozen. In all aspects of the tale, he is in top form. 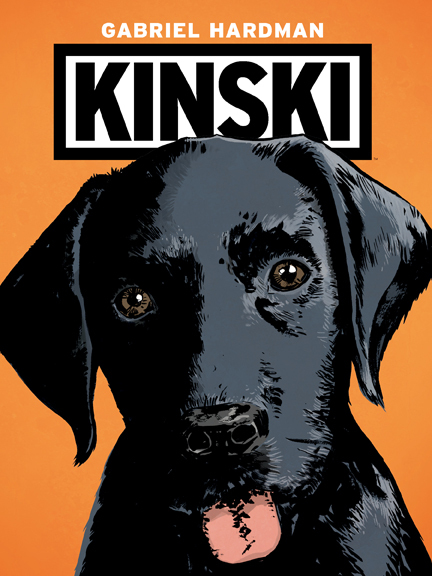 Kinski is a fun crime story starring an innocent dog caught up in human dilemmas. It is a quick read, but such an immersive one. Hardman has one-upped himself. Whatever’s next, I’ll be there from the off. 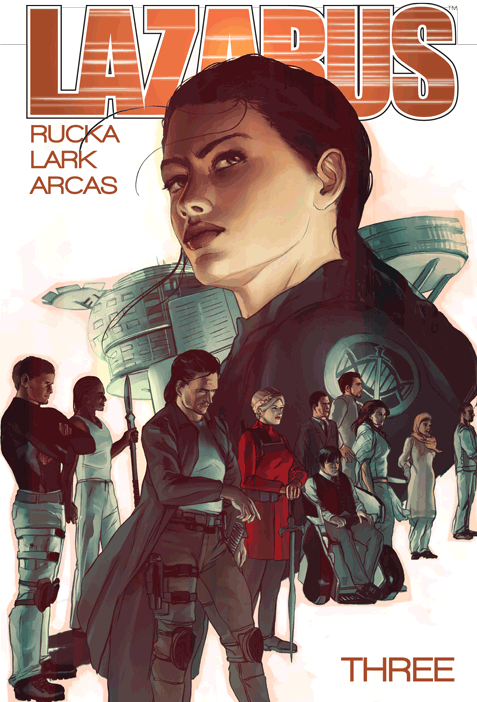 Conclave is the third volume in Greg Rucka and Michael Lark’s sci-fi epic Lazarus, and the series continues to fire on all cylinders, seamlessly blending fascinating world-building with character development, and a labyrinth plot. There’s been a resurgence of science fiction in recent years – Black Science, Copperhead, Saga, to name just a few – but Lazarus is in a class of its own. For those who came in late, Lazarus takes place on a world divided by wealth rather than political or geographical boundaries. Sixteen families control various locations; some are allied, others have uneasy alliances, while some function with outright hostility. Those who provide a service for a family are protected and ‘lifted’ to the status of Serf, which guarantees them, and their loved ones, a level of comfort and care unattainable for the rest of the population, who are left to fend for themselves: thus their designation, Waste. Forever is the genetically engineered protector of the Carlyle family – their Lazarus – who, following events in the series’ first two volumes, is beginning to question her familial alliance, and at an inopportune time, too, as the first conclave between the world’s 16 families has been called in order to repair the seemingly irrevocable conflict between the Family Carlyle and the Family Hock. The families meet on the luxurious Triton One, where negotiations quickly descend into violence, and Forever is forced into undesirable action against a fellow Lazarus. In the past, that wouldn’t be a problem: she is the Family Carlyle’s sword, it is her duty to fulfil her father’s wishes. But does Forever still believe in the veracity of her obligation? Rucka and Lark are again in fine form. One quickly runs out of superlatives in this reviewing business, but these creators deserve them. Rucka’s an expert at removing all exposition and letting his artist portray what needs to be, and Lark never disappoints. Conclave is yet another display of their brilliant partnership. However long Lazarus lasts, it won’t be long enough. I want this team together for the long haul. Maintaining its nuanced approach, Lazarus, Vol. 3: Conclave maintains the series’ momentum. I can’t recommend it highly enough. If you haven’t jumped aboard the Lazarus train, you need to. We’ll be talking about it for the next few decades as it secures placements in umpteen “Best Of” lists. Don’t miss out. Imagine Justified set in a Star Wars-esque galaxy: that’s Copperhead in a nutshell. But if derivative comparisons aren’t your thing, let me save you some time: Jay Faerber and Scott Godlewski’s new science fiction series is brilliant. It’s brimming with imagination, has a colourful cast of characters, features plenty of action, but essentially, packs plenty of heart. At a time when Image Comics is constantly redefining comics’ Gold-Standard, Copperhead is up there with the very best the medium has to offer. The imagery in Copperhead is stunning. Scott Godlewski and Ron Riley team up to perfectly render the world’s desolate landscape, and clearly had fun creating the assortment of alien creatures and technology displayed on these pages. They employ fantastic use of negative space, and the action is dynamically and brutally captured. Faerber has maintained his uncanny knack of locating talented artists just waiting for the right ‘breakout’ project. Copperhead is certainly Godlewski’s. 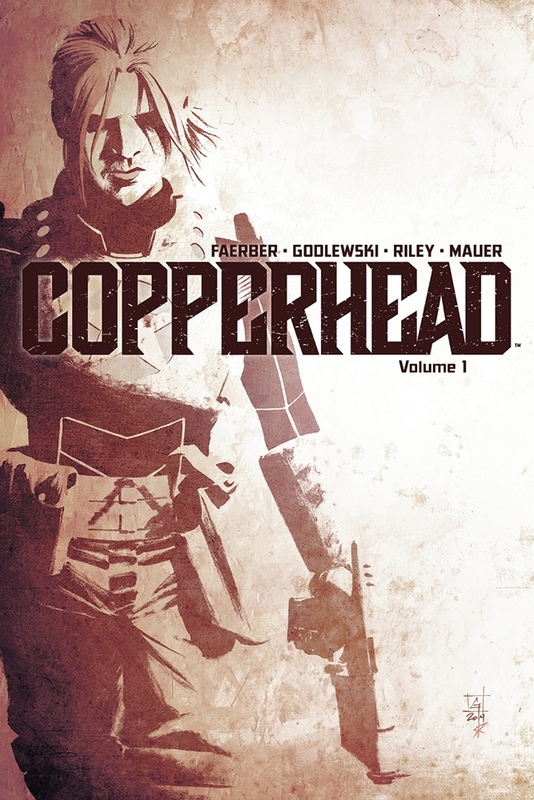 Copperhead: Volume 1 hints at a wider universe and its history without delving into too many specifics. This is serial fiction, after all; information will be teased out gradually as Copperhead continues. Like its characters, there’s depth to this world; we don’t know the extent of it, but it feels like a living, breathing galaxy, with a backstory we’re not yet privy to. And speaking of backstory, Clara’s is shrouded in mystery, too; what events from her past have landed her this deadbeat assignment? Where’s her ex-husband? And why is she so protective of Zeke, to the extent he’s not allowed outside their home without her? These are all mysteries waiting to be revealed. And when they are revealed, I’ll be there, guaranteed. Copperhead: Volume 1 has hooked me in for the long haul. Ed Brubaker and Sean Phillips’ latest collaboration from Image Comics mines familiar territory in spectacular fashion. Set in 1948, The Fade Out is a sprawling and ambitious narrative focused primarily on Charlie Parish, a Hollywood writer haunted by wartime memories, who – true to form – has taken to the bottle in a bid to relieve himself of these vivid recollections, thus irreparably damaging the creative spark necessary to succeed in the business. And if that wasn’t bad enough, production on the noir film he’s working on has stalled because of the death of its up-and-coming starlet. Charlie’s alcohol-imbued mind potentially holds the key to unlocking the mystery of her death; but does he truly want to? 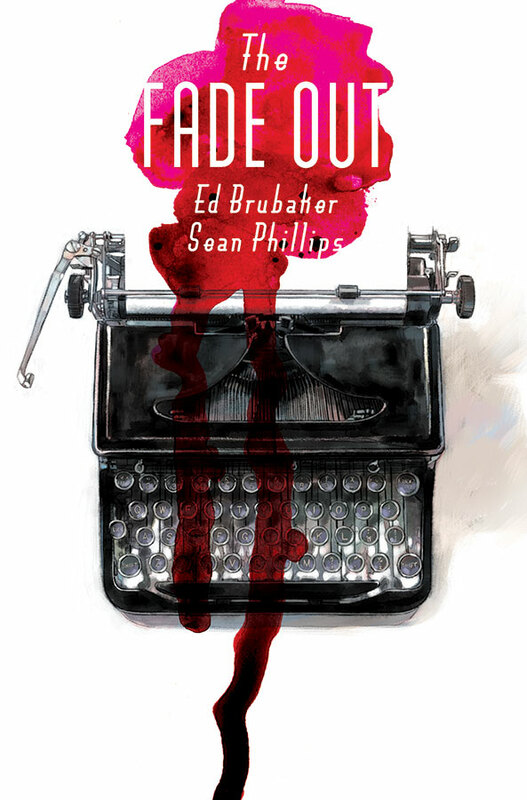 Sleeper, Criminal and Fatale honed Brubaker and Phillips’ partnership; The Fade Out raises their bar to an impossible level. The plot is labyrinthine, and Brubaker utilizes deft third-person narration to drive the story; clunky in the hands of less-talented writers, but perfect here. The story involves an extensive cast of characters – some recognizable faces from Hollywood’s yesteryear – and no doubt some plot threads will turn out to be red herrings. Inevitably the role of any first volume is to entice the reader to continue onto the second: that’s guaranteed, here. The art alternates stylistically depending on the situation, and it’s a wonder to behold. Few, if any, illustrators operating today guarantee the clean and precise storytelling of Phillips’. He’s truly in a class of his own, and is wonderfully aided by the colours of Betty Breitweiser. Together, they capture the feel of late-1940’s Hollywood exactly as I imagine it. The Fade Out reaffirms Brubaker and Phillips’ status as the numro uno creative team in comics. For crime and mystery readers, it’s an absolute must. Ed Brubaker and Sean Phillips’s Criminal is a delightfully unpretentious crime series: it unabashedly embraces its noir roots, unembroidered by cheap theatrics or anomalous twists. Its various volumes, now published by Image for the first time in redesigned editions, are imbued with its creators’ regard for the genre, and represent the pinnacle of their respective careers. Coward is our entry into this dark, rain-drenched, graffiti-daubed world; professional thief Leo is our guide. Leo is a criminal who knows when to walk away – or run, in the worst case scenario – from a job. And because of his proclivity for caution – his determination to survive – Leo has been dubbed a coward. And he’s okay with that – mostly. Because ultimately, he’s still here, while many of his friends are not. So now, five years after his last big heist went terribly awry, Leo works alone, pulling small jobs; enough to get by financially, and support his father-figure’s drug habit. It’s not a happy life, but he’s living, and for Leo, that’s enough. Of course, things soon change when figures from Leo’s past return, bringing him back into the fold: a big job with a massive payoff, surely too good to be true. But Leo should’ve trusted his reservations and walked away. Because there’s nobody you can trust less than a cop on the take; especially one with nothing to lose. Coward reads like a Parker novel (although Leo isn’t quite as menacing as Richard Stark’s protagonist) – fast-paced, populated with a menacing cast, and punctuated with moments of brutal violence; vicious, but not gratuitous. Brubaker, Phillips, and Val Staples on colours, are operating at their zenith, demonstrating harmony on the coloured page. 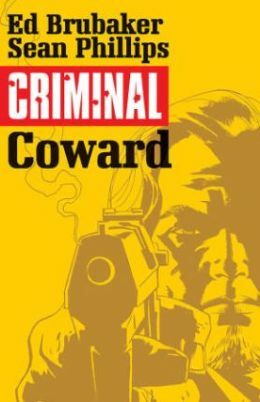 There is no better crime comic than Criminal; there are few better crime stories than Coward, period. 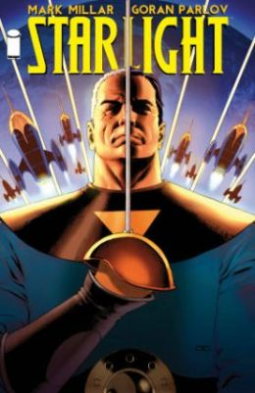 Starlight is an action-packed throwback to the cosmic swashbuckling adventures of Buck Rogers and Flash Gordon, but with its own unique twist. Only his wife believes his stories, but at the very start of Starlight she has recently passed away, leaving Duke alone, with nothing but his fading memories, and two aloof sons. Writer Mark Millar and artist Gorlan Parlov excel at highlighting Duke’s insolation, and his status as the punchline for cruel ‘senile old man’ jokes. It’s impossible not to feel sympathy for this unrecognised hero, who doesn’t demand adulation for his exploits: just respect. Then a rocket ship lands on his front lawn, and a twelve year old boy from Tantalus calls Duke back into action. Turns out he didn’t save the faraway planet of Tantalus when he disposed of Typhon – instead, he left their world free for the taking. But does Duke still have it in him, forty years later, to be the hero the planet needs? Mark Millar has always excelled at those ultra-cool action-packed moments, but sometimes they’ve come at the detriment of the narrative: all flash, no meat on the story’s bones. With Starlight he takes a different approach, with a tighter focus on character, while still allowing room for those iconic moments, which are spectacularly rendered by Parlov, whose work here eclipses even that of Fury: Max. Duke McQueen is a brilliant protagonist: the archetypal fear-nothing-in-the-face-of-danger tough guy, whose only weakness is his inner turmoil, and his disenchantment with life back home. He’s backed up by some fun secondary characters, and ludicrous villains, who are just begging to be punched in the jaw. Starlight is just fun. It’s a light-hearted space adventure story with plenty of heart. Bring on the sequel.